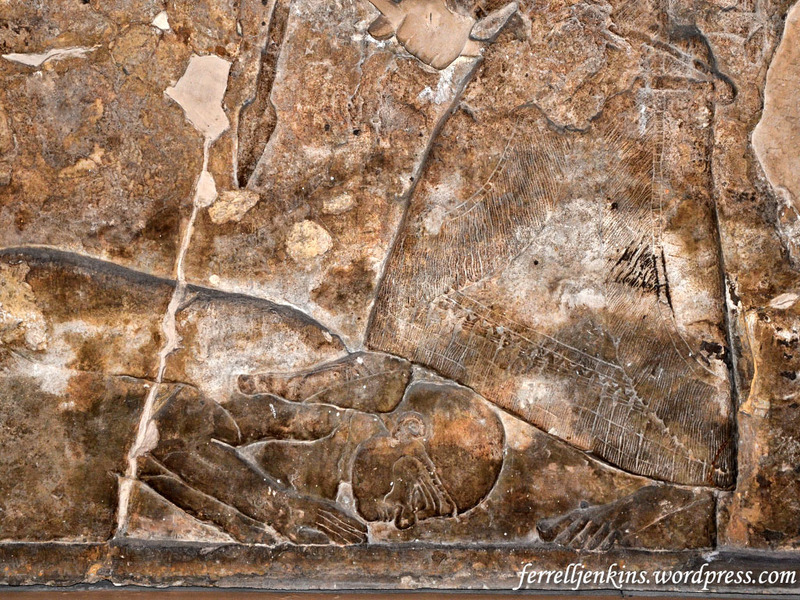 In the previous post we discussed the common motif found in the Ancient Near East showing a monarch with his foot on the neck of a subdued enemy. We discussed how this helps us visualize certain Biblical texts. Here I wish to add an illustration from the Roman world shortly after New Testament times. 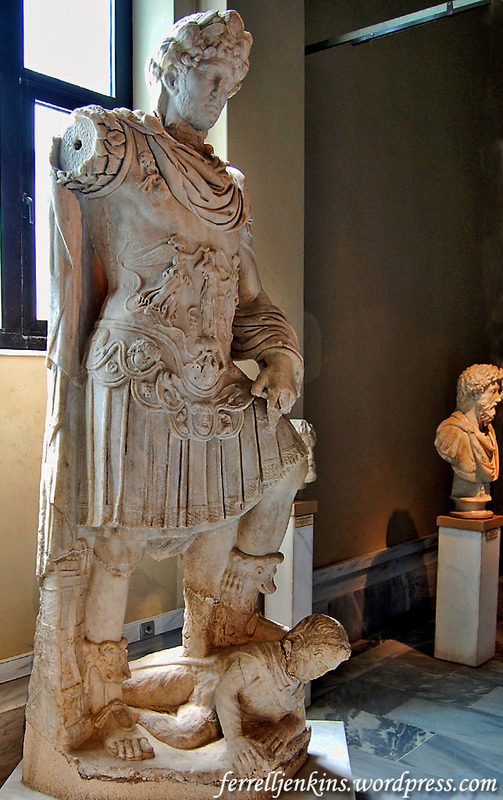 In the statue below we see the Emperor Hadrian (A.D. 117-138) with his foot on the neck of an enemy. 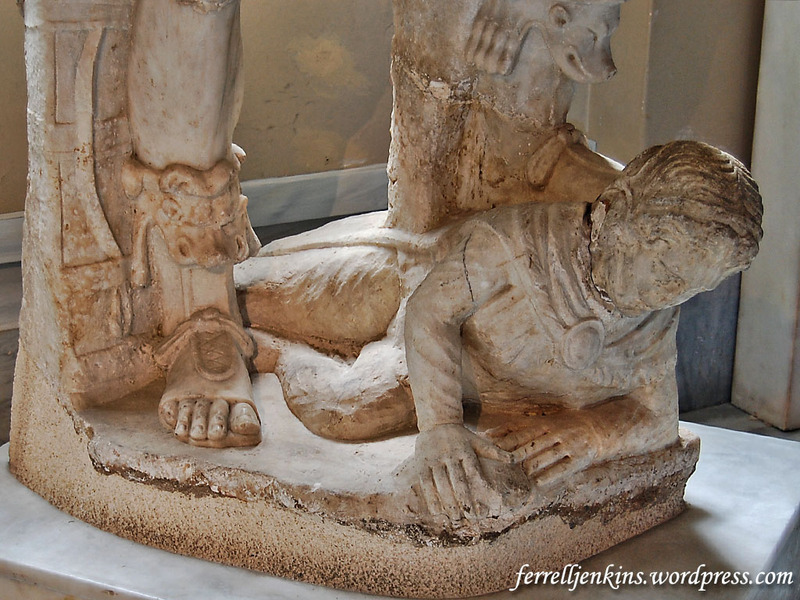 Hadrian has his foot on the neck of an enemy. Istanbul Archaeology Museum. Photo by Ferrell Jenkins. This statue is displayed in the Istanbul Archaeology Museum in Istanbul, Turkey. It is made of marble and is said to have come from Hierapitna, Crete. The photo below is a closeup of the captive with the Emperor’s foot on his neck. Closeup of Hadrian with his foot on the neck of an enemy. Photo by Ferrell Jenkins. In the New Testament, Peter quotes Psalm 110:1 to show that Jesus is now seated on the throne of David at the right hand of God (Acts 2:35). The illustrations here and in the previous post are suitable for use in PowerPoint presentations for sermons and Bible classes. We only ask that you leave our credit line intact so others will know how to reach our material. From the time of my earliest tours I noticed that the tour members were surprised to see various goods carried on the head. In the Middle East it is common to see women carrying buckets of water on their head without even steadying them by hand. In the Middle East and Europe bread is transported on carts, and sometimes on the head, without any covering. The photo below was made in the Muristan of the Old City of Jerusalem. These loaves of bread and other bakery goods may be headed to restaurants where they will be turned into sandwiches for hungry patrons. 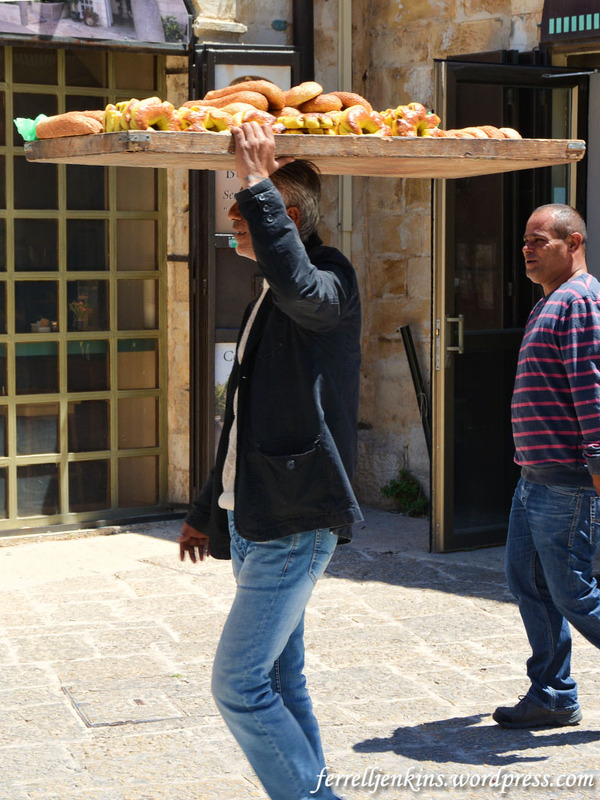 Man carrying bread on his head in the Muristan area of the Old City of Jerusalem. Photo by Ferrell Jenkins. Bread is an important staple in the diet of many people. And the bread we are speaking of here is not like that “old lite bread” as my late mother in law used to call modern prepackaged loaves of bread. She made the bread for her family in her own kitchen. On my earliest tours in the late 60s and 70s of the last century the bread served was hard and sometimes it was baked in such a ways as to have a hollow center. 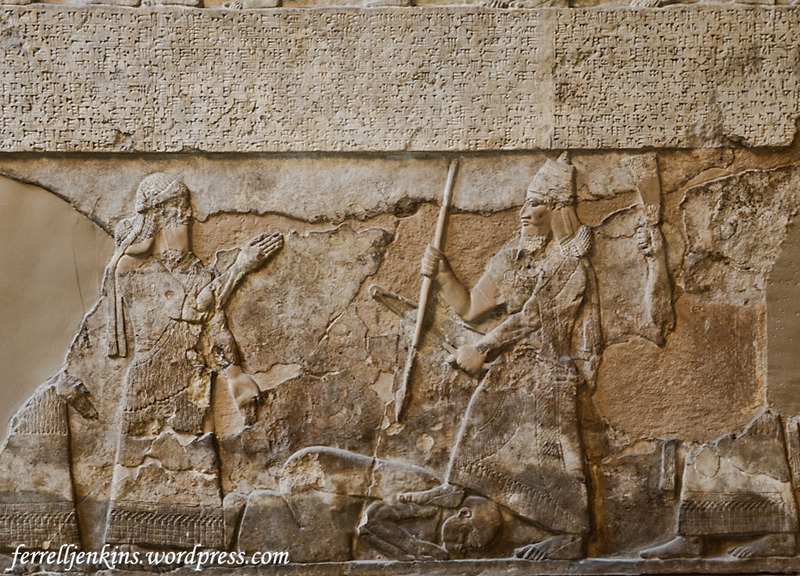 The ancient Israelites were dependent on crops of grain for their bread. Wheat and barley were major crops in the Promised Land. When the prophet Jeremiah was in prison he thinks that he may die. He requested that he not be sent back to the house of Jonathan the secretary lest he die there. King Zedekiah ordered that Jeremiah be committed to the court of the guard and that bread be delivered to him daily from the baker’s street until there was no longer bread in the city. I am old enough to remember the rationing of World War II. Farmers were in a little better position to have stores of corn from which our bread was made in those days. During the Wilderness Wandering the Israelites were provided with manna which the Psalmist called the bread of angels. The words of Jesus have added significance to those born into humble circumstances. We must remember that we are sustained both physically and spiritually by the bread that the Lord provides. Seventh century B.C. 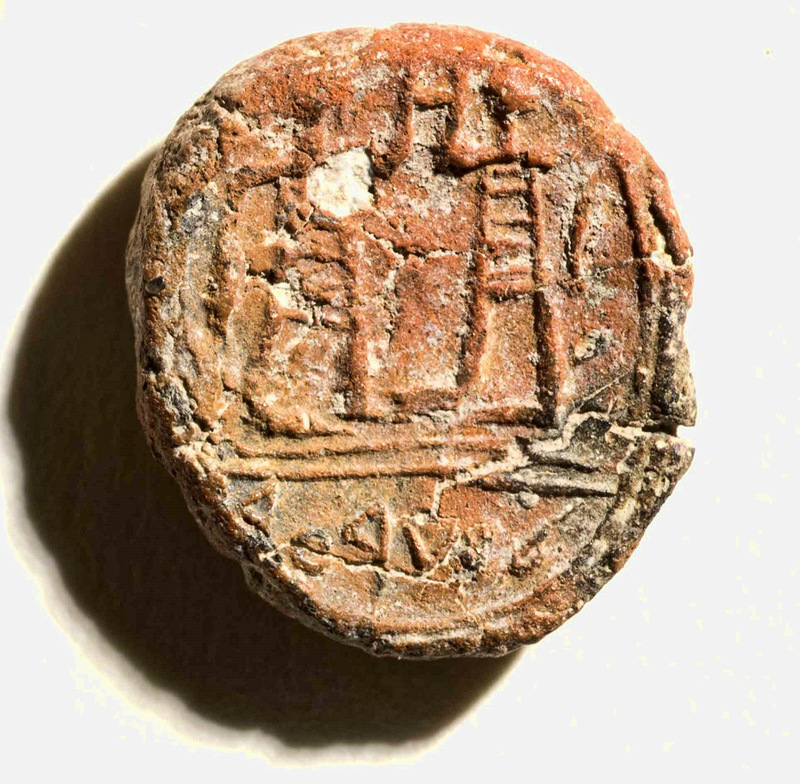 seal impression showing two men and bearing the inscription “governor of the city.” IAA photo by Clara Amit. Prof. Tallay Ornan of the Hebrew University, and Prof. Benjamin Sass of Tel Aviv University, studied the sealing and describe it thus: “above a double line are two standing men, facing each other in a mirror-like manner. Their heads are depicted as large dots, lacking any details. The hands facing outward are dropped down, and the hands facing inward are raised Each of the figures is wearing a striped, knee-length garment. In the register beneath the double line is an inscription in ancient Hebrew: לשרער, with no spacing between the words and no definite article. It denotes לשר העיר, i.e., “belonging to the governor of the city.” Prof. Ornan and Prof. Sass add, that “the title ‘governor of the city’ is known from the Bible and from extra-biblical documents, referring to an official appointed by the king. Governors of Jerusalem are mentioned twice in the Bible: in 2 Kings [23:8], Joshua is the governor of the city in the days of Hezekiah, and in 2 Chronicles [34:8], Maaseiah is the governor of the city in the days of Josiah. The original seal that made this impression may have belonged to one of these men, or to some other person not named in Scripture. This discovery is another in a long list of those illustrating the historical setting and accuracy of the Bible. Todd Bolen reported on this discovery, including a different photo of the seal impression, and several interesting links here.